Beetnut is a new meat-free eatery to join the Lagerstrasse family. Although I do eat meat, I’m very fond of vegetables too and really love popping in here for breakfast, lunch or dinner. The menu is fun, vibrant and colourful, and the Beetnut folks really know how to deliver top notch veggie goodies. Growing up in Ireland, porridge was a staple breakfast on our cold winter mornings, but you rarely see it on Zurich menus. Beetnut is the exception. During the week they have a small breakfast menu including berry porridge and apple porridge (among other things). 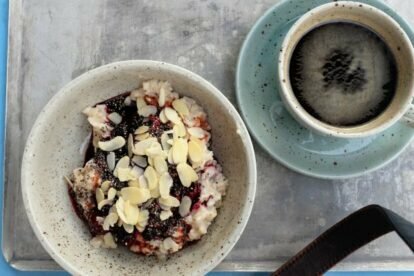 I love the tart berry porridge, sprinkled with almonds and chia seeds. It’s tasty, pretty and keeps you going for the whole day. They also serve delicious buddha bowls, salads and smoothies, as well as great coffee and an impressive selection of natural wines. On Sundays, they offer a more substantial brunch menu with Skakshuka being my go-to choice. This should definitely be the first stop for all plant lovers out there!